The pregame festivities are getting underway for the Vegas Golden Knights vs. Washington Capitals in Washington, D.C. Part of those festivities include a performance by Fallout Boys. Bryan Callahan reporting. The Vegas Golden Knights and Washington Capitals will take the ice at T-Mobile Arena in Las Vegas for Game 5. Golden Knights lose Game 5 against the Capitals 4-3. Capitals win the Stanley Cup for the first time. Washington gets the first shot of the game but Marc-Andre Fleury comes up with the save. Golden Knights first shot of the game is 4:10 into period, saved by Braden Holtby. VGK with some nice pressure around the 6-minute mark, but the Capitals defense holds strong. Still no score. I need to see a replay of that sequence about 7 minutes in as it looked like Fleury and the Golden Knights were in a scary situation. Came away without a Capitals goal though. Golden Knights with a couple chances around the 10:30 mark, but the Capitals continue to clog the front of the net. No score. Capitals are getting their first power play of the game 11:44 in. Washington has been outstanding on the power play in the series. The penalty is on Colin Miller for interference. Fleury fights off a couple strong shots in the first Capitals push during the power play. VGK does a good job of clearing the puck and kills the penalty. Tomas Tatar lost the handles without getting a shot off on a good opportunity about 17 minutes in, still scoreless. They head to the locker room scoreless. 20 seconds into the period Shea Theodore is called for tripping giving the Capitals their second power play of the game. Golden Knights managed to kill the penalty without any damage. Golden Knights get their first power play of the game after Capitals Christian Djoos is called for the high stick. Capitals take the lead after Jakub Vrana beats Fleury on the breakaway. 1-0 Capitals 6:24 into the 2nd. Golden Knights pushing for the equalizer quickly, but Holtby is turning them away. Need to see a replay to determine who gets credit, but the Golden Knights tie it about halfway through the 2nd. Nate Schmidt gets the credit according to officials. Alex Ovechkin quickly answers with a power play goal of his own giving the Capitals the 2-1 lead. Golden Knights get the game-tying goal after a coach's challenge determines no goalie interference. David Perron credited with the goal because the puck hit him as he fell into the goal. The initial shot by Tomas Tatar deflected by Colin Miller into Perron. Golden Knights get a power play with just over two minutes left as Washington gets called for tripping William Karlsson. Ovechkin called for the penalty. Golden Knights take a 3-2 lead in closing seconds of the 2nd period. Reilly Smith with the goal. A skirmish follows the goal and referees are now working to sort things out. The @GoldenKnights have a 3-2 lead following a second period which featured five combined goals. Tomas Tatar called for hooking giving the Capitals a power play 5:30 into the 3rd. Fleury stops the only real threat of the power play and the Golden Knights kill the penalty. Capitals tie it. 3-3 with 10 minutes to go. Devante Smith-Pelly gets credit for the goal. Lars Eller swoops in to net one after the initial shot slipped between Fleury's legs. 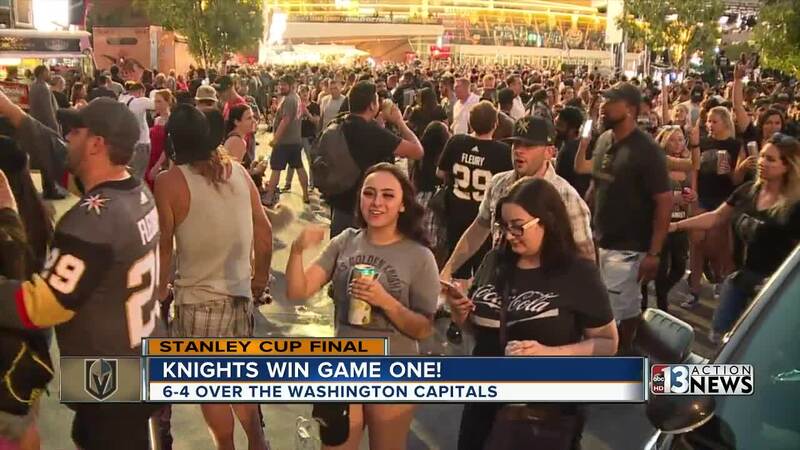 The Golden Knights will head home facing elimination in Game 5 of the Stanley Cup Final after falling to the Washington Capitals 6-2 Monday night. Two-man advantage leads to a Brett Connolly goal giving the Capitals a 6-2 lead. Now we are headed to a two-man advantage for the Capitals with 2:12 left after Brayden McNabb is called for a cross-check. A fight following leads to Deryk Engelland being given a game misconduct. T.J. Oshie of the Capitals also called for misconduct. Capitals get another power play after Nate Schmidt was caught tripping. 3:03 left in the game. Michal Kempny extends the Capitals lead to 5-2. Reilly Smith closes the gap to 4-2 beating Holtby who has been stellar all game. Ovechkin got a small breakaway going on his own, but Fleury made a nice stop with a quick clear by the defense. The Golden Knights finally get on the board thanks to James Neal just seconds after the end of the power play. The Golden Knights managed to kill the penalty and now they get a power play of their own. Evgeny Kuznetsov was called for hooking with 16:18 left in the 3rd. Erik Haula called for slashing. Capitals get a power play early. The Golden Knights pay for the penalty with another Capitals goal. This one off the stick of John Carlson. Holtby with another save and Golden Knights James Neal is called for slashing in the scramble for the loose puck. Capitals are on the power play with 5:15 left. The Capitals managed to kill the penalty again without much of a look for the VGK. Tom Wilson to the penalty box with about 10:30 left on the clock. Another Golden Knights power play opportunity. The Golden Knights missed another opportunity as Holtby blocked a shot that is unclear he ever saw. Penalty killed by the Capitals followed by a glove save by Braden Holtby to keep the Golden Knights off the board. William Karlsson tripped heading to the goal. Golden Knights on the power play. Lots of back and forth on both sides in the first five minutes of the period, but no serious threats. The Golden Knights appeared to dominate the 1st 10 minutes of the game, but were repeatedly turned away by Braden Holtby's goalkeeeping. The tripping call against Colin Miller gave the Capitals the power play goal that really seemed to shift the momentum and the floodgates as Washington scored 3 goals in the final 10:34 seconds of the 1st. The hits just keep coming as Devante Smith-Pelly beats Fleury to give the Capitals a 3-0 lead in the closing seconds of the 1st period. Tom Wilson gets another one by Fleury giving the Capitals a 2-0 lead with 3 minutes left in the 1st. Just under 10 minutes into the first the Capitals take the 1-0 lead with a Power play goal. T.J. Oshie gets the goal. Vegas Golden Knights vs Washington Capitals at Capital One Arena in Washington, D.C., on June 4. The game starts at 5 p.m.
Capitals win Game 3 of the Stanley Cup finals 3-1. Capitals score again, maintaining their lead over the Knights 3-1. Golden Knights score, making it 2-1 Capitals. Capitals lead the Golden Knights at the end of the second period 2-0. In the latter half of the period, the Capitals make a drive towards the net, and Evgeny Kuznetsov shoots it in. Capitals lead 2-0. The Capitals take several shots in a row at a rapid fire pace. Alex Ovechkin finally shoots it into the net. The score is now 1-0 with the Capitals in the lead. The Golden Knights are tied with the Capitals after the first period 0-0. Though the Capitals shot the puck past Marc-Andre Fleury, no goal was scored due to goal interference from Devante Smith-Pelly. Vegas Golden Knights lose 3-2 against Washington Capitals in game two of the Stanley Cup Final. GOLDEN KNIGHTS GOAL: Shea Theodore scores moments into the power play, Golden Knights cut into Washington's lead making it 3-2. T.J. Oshie gets called for cross-checking, and Vegas is on the power play with 2:25 remaining in the period. Dmitry Orlov is called for a hooking penalty, so Vegas will get a power play for about 1:30 once they finish their penalty out. Ryan Reaves is called for roughing, Washington will go on the power play moments after scoring its third goal of the game. WASHINGTON CAPITALS GOAL: Brooks Orpik scores for Washington, Capitals take a 3-1 lead. Offsetting penalties again; this time it's Erik Haula and Nicklas Bakstrom each serving 2 minutes for holding. WASHINGTON CAPITALS GOAL: Alex Ovechkin scores on the Washington power play, and the Capitals take a 2-1 lead. Alex Tuch is called for cross-checking, and Vegas now goes on the penalty kill. Golden Knights get its first power play of the game. WASHINGTON CAPITALS GOAL: Lars Eller scores on a wide open net to give the Capitals their first goal of the game. It's now tied 1-1. Offsetting penalties, the first of the game, put T.J. Oshie and Deryk Engelland in the penalty box. GOLDEN KNIGHTS GOAL: James Neal scores the game's first goal, as Vegas leads 1-0. That was the 7th shot on net from the Knights in the first 9 minutes of the game. Holtby impressing so far. Vegas has challenged him a few times in the first 5 minutes, and he's holding his ground with 3 saves so far. Deryk Engelland with the first shot of the game, glove save from Braden Holtby. FINAL SCORE: Golden Knights win 6-4. Golden Knights score again, now lead 6-4. Golden Knights score again to take the lead 5-4. Golden Knights score to tie the game 4-4. Capitals score to take the lead 4-3. Capitals get their first power play of the game, Vegas is called for too many men on the ice. WASHINGTON CAPITALS GOAL: John Carlson scores for the Capitals, ties the game 3-3. GOLDEN KNIGHTS GOAL: Reilly Smith scores to give the Golden Knights a 3-2 lead. WASHINGTON CAPITALS GOAL: Nicklas Backstrom scores on a rebound in front of net to give the Capitals a 2-1 lead. GOLDEN KNIGHTS GOAL: William Karlsson scores after a shot bounces behind the net right to him. Ties the game up 2-2. WASHINGTON CAPITALS GOAL: Brett Connolly scores for the Capitals to tie the game 1-1. GOLDEN KNIGHTS GOAL: Colin Miller scores on the power play, giving Vegas a 1-0 lead. 6 minutes into the game, Vegas gets the first power play after a boarding call on Washington. Vegas is doing a good job of keeping possession of the puck right now and challenging Braden Holtby. The Capitals netminder is holding steady so far with 5 saves. Game 1 of the Stanley Cup Final is minutes away from starting. The Golden Knights are playing in its first Stanley Cup during its inaugural season. Washington last played in the Stanley Cup Final in 1998. Halfway through the third period, the VGK maintains their lead over the Jets at 2-1. SCORE AT END OF PERIOD 2: The Golden Knights take the lead over the Jets at 2-1. VGK's Luca Sbisa shoots the puck towards the net and Ryan Reaves knocks it in. Golden Knights are up 2-1. SCORE AT END OF PERIOD 1: VGK is tied with the Jets at 1-1. Right as the puck drops, Josh Morrissey scores one for the Winnipeg Jets with about 3 minutes left at the end of the first period. Five minutes into the first period, Alex Tuch scores the first goal for the Vegas Golden Knights. 🎥 Coach Gallant: Sure, we're in a good position, but that doesn't mean a thing. You have to win four games in a series and today's another game. Reilly Smith scores for the Golden Knights with 6:30 left to play, VGK leading 3-2. Jets tie things up again, 2-2. SCORE AT END OF PERIOD 2: VGK leads 2-1. Less than a minute later, Tomas Nosek answers for the Golden Knights, VGK now leads 2-1 with 9 minutes left in the 2nd. Winnipeg scores with 10:28 left in the second, game now tied 1-1. SCORE AT END OF PERIOD 1: VGK leads 1-0. William Karlsson strikes first with a goal on the power play to put the Knights up 1-0. FINAL SCORE: Vegas Golden Knights win 4-2 against the Winnipeg Jets in game 3 of the Stanley Cup Playoffs. VGK lead the series 2-1. SCORE AT END OF PERIOD 2: VGK increases their lead 3-1. SCORE AT END OF PERIOD 1: VGK is winning 1-0 against the Jets. Golden Knights Goal: Johnathan Marchessault scores off of the Winnipeg turnover just seconds into the game. Official time of the goal was at 19:25 in the 1st period. FINAL SCORE: Vegas Golden Knights win 3-1. The series is now tied 1-1. SCORE AT END OF PERIOD 2: Score is still 2-0 with Vegas Golden Knights leading. SCORE AT END OF PERIOD 1: Vegas Knights are winning 2-0. VGK has now score twice in the first period. VGK has scored the first goal of the game. Final Score: The Golden Knights lose Game 1 4-2 to Winnipeg. Golden Knights call a timeout, Marc-Andre Fleury is pulled from net, as Vegas still trails 4-2. Down 2 with 5:30 remaining, Vegas needs to consider pulling Marc-Andre Fleury soon. It's another power play for Winnipeg, as Ryan Reaves heads to the box on a charging call. Golden Knights Goal: William Karlsson scores on a power play, Winnipeg leads 4-2 to end the second period. Winnipeg Jets Goal: Dusting Byfuglien's shot is redirected by Mark Scheifele, and the Jets take a commanding 4-1 lead. Winnipeg nearly scores, with the puck going right along the crease, and Vegas gets called for hooking immediately after to put the Jets on a power play. Vegas hasn't been able to keep the puck in the Jets end for very long. Winnipeg doing a good job of forcing the Knights to give up the puck quick, and it's forcing a lot of turnovers. Penalties all around following a post-save from on the Jets end of the ice. Energy level has dropped off a bit for Winnipeg early in the second period. Vegas with a few shots to start on Connor Hellebuyck. Golden Knights Goal: Brayden McNabb with a much-needed response from the Knights. Vegas puts a dent in the lead, it's 3-1 Winnipeg. Winnipeg Jets Goal: Joel Armia gets the goal, which was initially called off for goalie interference. Jets lead 3-0. Winnipeg Jets Goal: On the power play, it's Patrick Laine scoring for the Jets, and it's a quick 2-0 lead over Vegas. Vegas heads to the penalty kill, Alex Tuch called for holding, Jets get the man advantage with 14:16 to go in the period. Following the goal, huge chants of "Fleury" from the crowd, heckling him on giving up the game's first goal so early on. Winnipeg's crowd is one of the loudest in the NHL. Winnipeg Jets Goal: A minute and 5 seconds into the game, Dustin Byfuglien scores to put Winnipeg up 1-0. Game 1 is underway. Vegas is the more rested team, having 6 days off between rounds. Winnipeg has had 2 days rest following a Game 7 win over Nashville. We're minutes away from the start of Game 1 between Vegas and Winnipeg in the Western Conference FInal. Winnipeg gets home ice for the series, finishing with a better overall record and more points than the Golden Knights in the regular season. Final score: Golden Knights finish off the San Jose Sharks 3-0 to advance to the Western Conference Finals. Vegas will play the winner of the Winnipeg vs Nashville series. Cody Eakin hits an empty-netter, bringing the total score to 3-0 with the Golden Knights in the lead. After two periods: The Golden Knights lead 2-0. Fleury with another big stop, under 30 second to go in the period. After review, a shot off the post by Nate Schmidt is a goal, and the Golden Knights lead 2-0. Sharks start getting some pressure on the offensive end, as Fleury sprawls out for a save and a pair of shots go wide of the net. Fleury follows it up with another stop, his 14th save of the night so far. Jonathan Marchessault scores to give the Golden Knights a 1-0 lead. Thanks in large part to Marc-Andre Fleury, the Sharks stay off the board, and we're scoreless after the first period. Following a successful penalty kill, Vegas will now head on the power play, its first of the game. Delay of game called on Brayden McNabb, Vegas will be on the penalty kill. Fleury fends off the best look of the game from San Jose, Tomas Hertl with a breakaway, Fleury stops it and a second chance. Marc-Andre Fleury steps up early on with a big save. Fleury no stranger to series-clinching playoff games. Moments into the game, Golden Knights are hit with a penalty, Erik Haula heads to the box, and the Sharks are on the power play. Vegas Golden Knights win 5-3 against San Jose Sharks in game five of the Stanley Cup Playoffs. They now lead the series 3-2. And it's a second consecutive penalty for Theodore, giving San Jose another power play. Shea Theodore heads to the penalty box for cross-checking. San Jose will head to its second power play of the game. End of the second period: Golden Knights lead Sharks 3-0. GOLDEN KNIGHTS GOAL: Erik Haula scores from nearly behind the net to give the Golden Knights a 3-0 lead. GOLDEN KNIGHTS GOAL: Alex Tuch scores moments into the power play to put the Golden Knights up 2-0. Now it's San Jose's turn to serve a penalty, Tomas Hertl in the box for the Sharks, Knights will be on the power play. Vegas gets out of the power play unscathed, still up 1-0. 2:07 mark, penalty for VGK, Colin Miller heads to the box and San Jose is on the power play. After the first period: Golden Knights lead Sharks 1-0. GOLDEN KNIGHTS GOAL: With 3 seconds left in the period, James Neal scores to put Vegas up 1-0. Marc-Andre Fleury gets caught behind the net on a bad pass to a Sharks player, but is quick to get back in net and somehow makes the save. First 4 minutes of the game, Martin Jones stares down 3 good shots from Vegas, stops them all. Important lineup change for Vegas: Luca Sbisa makes his return to action for the first time since February 27. We're minutes away from the start of a pivotal Game 5 between the Golden Knights and Sharks. With the series tied 2-2, the winner of tonight's game will be one win away from closing out the series. 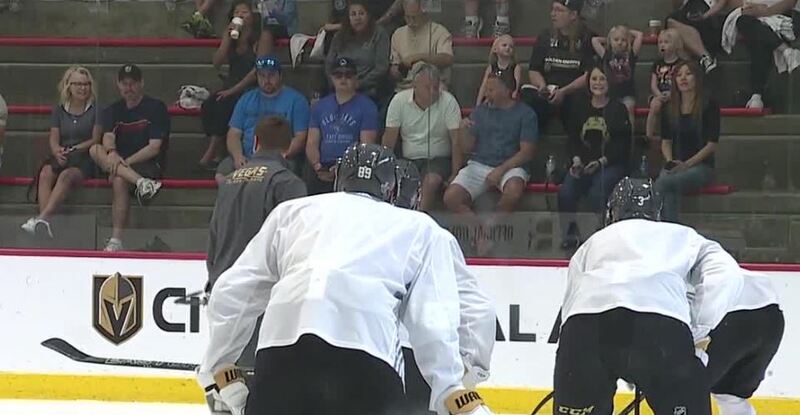 MAY 3: The Vegas Golden Knights returned to practice at City National Arena Thursday ahead of Game 5 Friday. Vegas Golden Knights lose 4-0 against San Jose Sharks in game four of the Stanley Cup Playoffs. VGK will face the Sharks in game five at T-mobile Arena on Friday. Sharks score on the power play, Joe Pavelski with the goal right in front of the net, and it's 4-0 San Jose. And with 8:44 to go, San Jose is now on the power play. Sharks kills the power play, in what has been Martin Jones' best game of the series so far. 27 saves for him, none bigger than his stop during that last VGK rush. The Golden Knights are back on the power play. Nearly a must score situation for VGK. San Jose leads 3-0 to end the second period. Golden Knights will be on a power play to start the third. Sharks do a good job of clearing the puck and killing the VGK power play to hold on to a 3-0 lead. VGK is going on a power play, and nearly scored before the Sharks touched the puck to stop play. After a Sharks power play fails, Tomas Hertl scores at the 5:35 mark in the second period, and San Jose leads 3-0. With 5 seconds to spare in the first period, San Jose tacks on its second goal. Joonas Donskoi scores from long distance to make it 2-0. Sharks manage to kill the penalty without VGK getting off too many scoring chances. Vegas will go on the first power play of the game, with 3 minutes to go in the period. SHARKS GOAL: Marcus Sorensen scores at the 15:37 mark of the first period, to make it 1-0 San Jose. VGK is doing a better job of creating traffic in front of the net. Martin Jones holding his own, stopping a pair of shots around the 12:30 mark of the period. Marc-Andre Fleury already stepping up to stop a few shots from the Sharks early in the first period. Game 4 between the Golden Knights and Sharks starts in just a few minutes. With a 2-1 series lead, VGK can close the series out with wins tonight and Friday night, back home. William Karlsson hits the game-winner in overtime to give the Golden Knights a 4-3 victory. The Golden Knights now lead the series 2-1. VGK gets another power play opportunity after the Sharks are called for delay. After several missed opportunities by the Golden Knights on the power play, Fleury makes an unbelievable save to keep VGK hopes for a win alive. VGK on the power play after Sharks were caught with too many men on the ice. We start overtime. Golden Knights scored three unanswered goals heading this direction in the 2nd period. We are headed to overtime again. Tomas Hertl ties it up with just under 2 minutes remaining in the game. Fleury stopping a point-blank shot with 5 minutes left on the clock and the Golden Knights clinging to a 3-2 lead. Evander Kane gets the Sharks second goal as the power play comes to an end. Goal upheld after a coach's challenge on goalie interference. Sharks to the power play after the Golden Knights get called for the cross-check. Fleury now making some great stops. Eventually ending with a dog pile in the crease that leads to the net being knocked off the posts. Martin Jones with 2 great saves to keep the Golden Knights from scoring a 4th goal early in the 3rd. Golden Knights start the period with 51 seconds remaining on their power play. Three unanswered goals by the VGK have the Sharks heading to the locker room down 3-1 after 2 periods. Golden Knights getting another power play after an interference call against the Sharks. Give the third Golden Knights goal of the game to Reilly Smith. 3-1 Golden Knights lead with about 5 minutes left in the 2nd. Jonathan Marchessault wastes no time capitalizing on the power play with a goal to put the Golden Knights up 2-1. Another power play for the Golden Knights as Sharks Tomas Hertl called for a shot at James Neal's head. Many would expect some questions from NHL Player Safety. Colin Miller evens things up with the power play goal. Score now tied at 1 halfway through the 2nd. Golden Knights set to start the power play 8 minutes into the 2nd. San Jose Sharks Timo Meier breaks the scoreless tie finally beating Fleury on the power play. Sharks back on the power play after a tripping call on the Golden Knights 5:30 into the period. The Sharks will get their first power play of the game 39 seconds into the 2nd period. Reilly Smith called for hooking. The Golden Knights head to the locker room tied at 0. Fleury largely to thank for keeping the Sharks off the scoreboard. Sharks take the first penalty of the game for delay about 14:30 into 1st. 11 minutes in the Sharks are outshooting VGK 9-4. Score is still 0-0. Martin stops another good opportunity from James Neal about 8:30 into the game. Another huge save from Fluery 7:45 into the 1st. The crowd at the Downtown Las Vegas Events Center gives a big cheer as Marc Andre-Fleury makes a save in traffic keeping Game 3 scoreless. Martin Jones makes a big save on a shot from Erik Haula 4:20 into the game. Game 3 is underway with the Golden Knights looking to return to their winning ways. Tomas Tartar is in the lineup tonight replacing Ryan Carpenter. The Vegas Golden Knights will play the San Jose Sharks in San Jose at 7 p.m. April 30. According to Bleacher Report , the Sharks opened as a minus-148 favorites (wager $148 to win $100) and total is at 5.5 goals. FINAL: The Vegas Golden Knights lose the game after it goes into double overtime. Fine score 4-3. The next game will be played in San Jose. END OF SECOND: Knights kill the penalty, still trail 3-2. When the third period starts, San Jose will have a power play for the first 1:32. SHARKS GOAL: Brent Burns scores his second goal of the night, and the Sharks now lead 3-2. SHARKS GOAL: Logan Couture ties the game 2-2. SHARKS GOAL: 2 minutes into the period, San Jose responds with its first goal of the series, it's now 2-1 Golden Knights. GOLDEN KNIGHTS GOAL: VGK starts off the second period with a bang, Karlsson again scoring, and it's a 2-0 Knights lead. GOLDEN KNIGHTS GOAL: Colin Miller shoots it wide intentionally, the puck bounces off the back-boards and Bill Karlsson scores the first goal of the game. Knights lead 1-0. 3:56 to go, San Jose's Brenda Dillon and Vegas' David Perron both take a seat in the penalty box, we'll go 4-on-4 hockey again. James Neal and Dylan Demelo will both serve penalties, so we've got 4-on-4 hockey for the next two minutes. Sharks with puck possession early on in the first period, with a few nice looks in front of the net, but Marc-Andre Fleury makes both saves. His Goals Against Average right now is half-a-goal per game in the playoffs, very impressive. Game 2 is underway at T Mobile Arena. The Golden Knights can hold home ice advantage, and take a 2-0 series lead with a win tonight following its 7-0 win in Game 1 Thursday. UPDATE APRIL 27: San Jose's Evander Kane has been suspended for one game for cross-checking Vegas Golden Knight Pierre-Edouard Bellemare during the first game between the two teams in the 2nd round of the playoffs. Vegas Golden Knights beat the Sharks 7-0 during their first playoff game on April 26. The next game will take place April 28 at T-Mobile Arena. After the 2nd period, Golden Knights lead the Sharks 5-0. GOLDEN KNIGHTS GOAL: Shea Theodore nets the Knights 5th goal of the night 3:30 into the second period. Following the goal, San Jose pulls goalie Martin Jones out. GOLDEN KNIGHTS GOAL: Alex Tuch with the power play goal, and VGK goes up 4-0 with 8 minutes to go in the first period. That's 4 goals on 7 shots! Knights on the penalty kill, Marc-Andre Fleury hugs the right corner of the net on back-to-back shots and stuffs them both. San Jose can't seem to get its bearings, especially after giving up 3 goals so fast. GOLDEN KNIGHTS GOALS: In the first 6 minutes of the game, goals from Cody Eakin, Erik Haula, and Jonathan Marchessault put the Knights up 3-0. An overwhelmingly impressive effort on offense from VGK so far. A few good looks on net for the Knights during that PP, but SJ gets the kill and are back to full strength. Martin Jones fights off a flurry of shots to start the period. The puck even flew up and nearly went over him. The Golden Knights now go on the Power Play after a minute of play. We are inside T-Mobile arena, with Game 1 between the Golden Knights and the Sharks just minutes away! Stay tuned here for in game updates. Round 2, game 1 will be Thursday, April 26 at 7 p.m. PT at T-Mobile Arena. The Vegas Golden Knights will face the San Jose Sharks. The game will be televised on NBCSN. END OF THIRD PERIOD: Golden Knights sweep Los Angeles Kings 1-0 in game four of a historic Stanley Cup playoff series. The Golden Knights have become the first team to sweep a Stanley Cup playoff series in their inaugural season. END OF SECOND PERIOD: Golden Knights lead the Kings 1-0. One more period for a 4-0 series sweep and a spot in the Western Conference Semifinals for VGK. 8:30 to go in the second period, and the Kings are on their first power play of the game. Marc-Andre Fleury seems so locked in this series, with 117 saves so far. The last goalie I can remember playing that well/aggressively was Tim Thomas in 2011 for the Bruins. Boston went on to win the Stanley Cup, with Thomas named MVP. Mandalay Bay crowd update: energy level obviously picked up after the VGK goal. A lot of eyes weren't fixed on the screen in the first period, now everyone is focused on the game. Of the teams I've watched in the postseason this year, I'd say the Golden Knights, Bruins, and Penguins look the best passing the puck around. Boston and Pittsburgh have a lot more household players than VGK does, but it hasn't stopped them from playing just as well. GOLDEN KNIGHTS GOAL: Brayden McNabb puts the Golden Knights on the board, VGK now leads 1-0 over the Kings. Second period is underway, David Perron with the first good look on net, but it's fanned away by Quick. END OF FIRST PERIOD: Golden Knights and Kings are scoreless. Marc-Andre Fleury with 14 stops in the period, Jonathan Quick with 8. With 1:10 to go in the period, Jonathan Marchessault nearly scores going glove side on Jonathan Quick, but he pulls off the save. Best look for the Golden Knights so far. Marc-Andre Fleury gets tested for the first time late in the first period, scrambles in front of net to stop the Kings from scoring. It's been a relatively low-key period so far. Game 4 is underway! Golden Knights starting out again with an aggressive, fast-paced style of play. Early chance comes off a pad save by Jonathan Quick that gets away from him. We're 20 minutes away from puck drop in Game 4 between the Golden Knights and Kings. 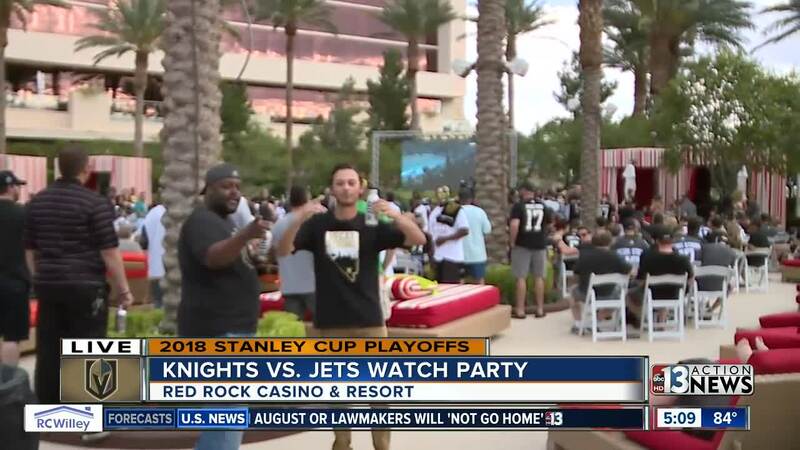 Ross Lippman will be updating the live blog all night from the official team watch party at Mandalay Bay Beach. A win for VGK, and it's a series sweep over LA. Only 4 teams in NHL history have ever overcome a 3-0 deficit to win its series, with the last being the Kings 4 years ago. The Golden Knights enter Game 4 in Los Angeles with a 3-0 series lead over the Kings. James Neal and William "Wild Bill" Karlsson scored 21 seconds apart in the 3rd period to lead the Golden Knights to a 3-2 victory over the Los Angeles Kings in Game 3 of their first-round playoff series. The Golden Knights now lead the series 3-0 and are one game away from advancing to the Stanley Cup playoff quarter finals. 4 on 4 now, everyone here is angry. After beating the Kings in the first 2 playoff games the Golden Knights will play game 3 in Los Angeles. The game starts at 7:30 p.m. Here's a look at the Knights practice at the Staples Center. 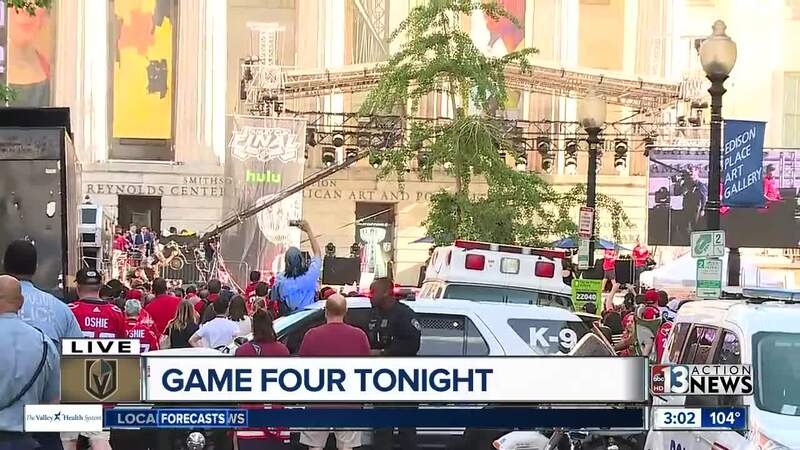 Many enthusiastic fans gathered outside City National Arena on Saturday to give the team support as they took off for the next game in Los Angeles. 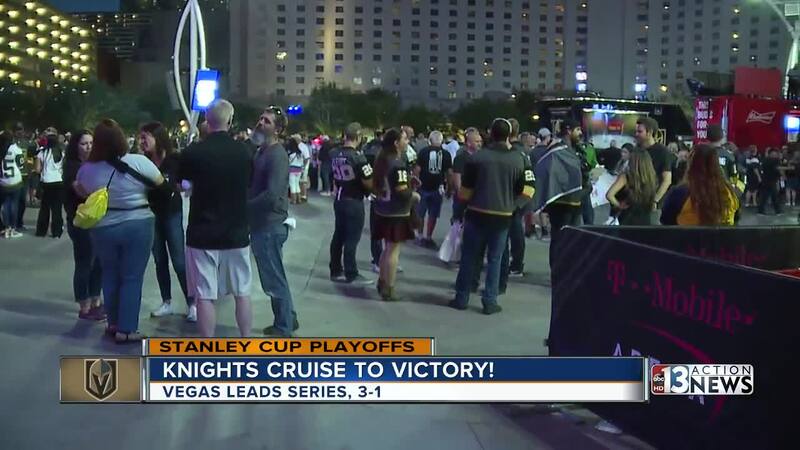 The Vegas Golden Knights win 2-1 in overtime and go up two games to none in their best-of-seven series against the Los Angeles Kings in front of 18,588 fans at T-Mobile Arena. Vegas' Alex Tuch put the Golden Knights up early with a power-play goal just shy of 15 minutes into the first period. Los Angeles tied the game with their own power-play goal by Paul LaDue with 4:03 remaining in the second period. The game's final goal was scored in the second overtime by Vegas' Erik Haula. The Golden Knights and Kings will play again on Sunday, Apr. 15, at the Staples Center in downtown Los Angeles. That game is scheduled to begin at 7:30 PM. Best home ice in the NHL... yeah we said it. Let’s go @GoldenKnights !! 🎥 Schmidt: "The biggest part of any series is winning your home games." The Vegas Golden Knights won their first Stanley Cup playoff game against Los Angeles Kings. The Vegas Golden Knights won 1-0. The Vegas Golden Knights have shattered records throughout their season including being the first true expansion team to make it to the Stanley Cup playoffs in their inaugural season. It took just 3 minutes 22 seconds for the Golden Knights to record the first playoff goal in franchise history as Shea Theodore netted what turned out to be the game-winner. Leaving the game, fans were talking about how the arena had a different atmosphere with very few Kings fans in the attendance leading to even louder cheers. Game two in the series against the Los Angeles Kings is 7 p.m. on Friday at T-Mobile Arena.